You don’t have to create a product or service. Marketing materials are already created. Business building system is already in place. Often, products and services are delivered by the company. Training and support from your sponsor and the company. In the end, it's very easy to get started fast: Simply buy your kit, take the training, and start building your business. In reality, success in direct sales, as in all home business, comes from having an interest and excitement about the business. Any business is hard to build if you don't understand it or aren't committed to it. If you don’t like or know anything about health and wellness, selling vitamins will be difficult. To determine if direct sales is for you, and to find the best direct sales company, start by answering the following questions. What types of products or services do I use and enjoy? There are direct sales companies in many industries and chances are there is a company that sells a product or service you can get excited about. How much time can I put into a direct sales business. Direct sales is a person-to-person business, in that you need to share the products directly to potential customers. This can be done in a variety of ways including party plan (hosting a group demonstration), one-on-one presentations, over the phone (one-on-one or conference calls), or webinars. Based on your current schedule, is there a type of presentation option that works best for you? Do you need a lot of tools and support to market your business? Do you have limits on how much you can invest? Some companies are $25 (sometimes less) to start, while others are $300, sometimes more. Answering these questions will help you narrow your search. Using the list below, you can find companies that offer products and services you’d be interested in selling (#1), and in studying the companies on the list, you can find out if they fulfill your needs in the rest of the questions. A big concern many would-be direct sales reps have is scams. Many scammers and schemers use a direct sales model, but don’t have a product or service, or one of real worth, making them a quasi-Ponzi or pyramid scheme. Check that the company is in the Direct Sales Association. All companies listed there must meet standards of business practices and ethics. Choose a company that has been around five years or longer. While new companies might be great options, they are at their most financial risk in the first few years. Choose a sponsor you can work with. You want a sponsor that doesn’t put pressure on you, while at the same time challenging you to reach your goals. Here are 16 great companies to consider in several categories. Unless otherwise noted, all these companies are a member of the Direct Sales Association. Some companies allow you to join through their website and others require that a consultant help you. The sites have resources to find a consultant in your area or to have one contact you. Many of these companies have operations in other countries outside the United States. You’ll need to visit each company to which countries they operate in. Many provide a website for consultants so your customers can order online. Be sure to read the rules on marketing, as some companies have limits on what you can do. With that said, with today’s technology, you can be creative. For example, instead of hosting a party in a home, you might be able to host a party through Facebook Live to demonstrate your products. Clever Container: Started in 2007, Clever Container is one of the newer companies on the list. If you like organizing, Clever Container has over 200 products, and several startup options form $49 to $99. Clever Container uses a party plan. Scentsy – Scentsy started in 2004 by selling wax tarts and warmers, and expanded into candles, and today includes several scented products such as bath, body and household cleaners. Scentsy uses a party plan. Tupperware – There are certain names that are synonymous with direct sales, and Tupperware is one of them. Although not in the Direct Sales Association, Tupperware was started in the 1940s, so it has a long track record of success. You’d be hard pressed not to find a household that didn’t have a piece of official Tupperware brand containers as they last long and are often handed down. Tupperware makes containers, pitchers and kitchen ware, and is always evolving to help make life in the kitchen easier. And if you’re worried about BPAs, as of March 2010, Tupperware products in the US and CA are BPA free. Tastefully Simple – In a world that likes convenience, Tastefully Simple offers over 60 meal kits sold through a party plan. You can get started for only $39. It uses a party plan system. Tealightful Tea – If you like tea, especially custom hand-crafted blends using fresh organic teas, herbs, spices and botonicals, you might want to consider Tealightful Tea. While I can’t find a start date, it is a member of the DSA. It uses a party plan. The Cocoa Exchange – Are you a chocoholic? The Cocoa Exchange offers chocolate brands of Dove, Pure Dark, and Pod & Bean. Beyond chocolate yum yums, The Cocoa Exchange also sells mixes (brownie, martini), teas, sauces, rubs, and more. It uses a party plan. Wildtree– If you’re concerned about eating all-natural organic food, Wildtree offers a business opportunity for you. It uses a party plan. WineShop – If you’re a wine lover, the WineShop can help you start a home business. The Wine Shop offers wine and gourmet food items. It uses party plan and person-to-person marketing. It goes without saying that you need to be 21 or older to start this business. The number of companies in this category is huge. A few top ones are listed below, but you can visit the DSA to see more. BeachBody– If you’ve heard of P90X or Shaun T, you’ve heard about Beach Body products. In this program, you become a coach, and along with selling its DVDs, you can also promote shakes and another nutritional supplements. It uses a person-to-person plan. Melaleuca – This is a company you may not have heard of, but it’s been around over 30 years and has an A+ rating at the BBB. Melaleuca offers safer, non-toxic home care, personal care, beauty, and other products. It also offers discounts through hundreds of retail partners, including Priceline.com, Barnes and Noble, Kohl’s, Verizon and more. The membership is $29, and then you buy products you need from it’s vast line of personal and home care items. Melaleuca uses a person-to-person plan, but differs in that you don’t sell products individually. Instead Melaleuca works like Costco or Sam’s club, in which people become members, and shop for what they want directly from the site. Shaklee– Shaklee, another company that has been around awhile, offers products for a health lifestyle. Everything from supplements to protein powder, they’re focus is on health in harmony with nature. It has a person-to-person plan. Mary Kay– Started in 1963, Mary Kay is the oldest and one of the most well-known names in direct sales. 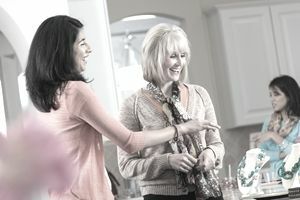 Mary Kay started the company with a vision to empower women. Its products are primarily skin care and beauty products. It’s a party plan and person-to-person plan, that also offers a store website and mobile business tools for consultants. While direct sales is a fast and easy way to start a business, it does require research and planning. Too many people make mistakes in their direct sales business, and end up quitting. Like any other business, you should have a business plan and a way to get your business in front of customers and potential new business builders.